Predicting how a foreign player will adjust to life in the Premier League is from an exact science. Get it right and there are bargains to be had, as Swansea City found with Michu last season. However, history is also littered with many expensive mistakes – players who arrived in England with emerging reputations but departed bereft of confidence, the word ‘flop’ ringing in their ears. About to become the Swans’ latest acquisition, Wilfried Bony already knows how it feels to leave these shores feeling unfulfilled, having been turned down by Liverpool after an unsuccessful trial in 2007. Still just a teenager at the time it would’ve felt like a dream being snatched away for the young Ivorian, but in reality they probably did him a favour. Not yet considered ready for one of Europe’s elite leagues, Bony took himself to the Czech Republic and Sparta Prague. It was the start of a much more organic approach to his growth as a player, one which has encouraged steady development and helped establish an impressive level of consistency. To begin with, Bony’s move to Sparta Prague was a loan deal – but after impressing in their ‘B’ side’s title win in 2008, a permanent transfer was agreed with Cote d’Ivoire Premier Division club, Issia Wazi. His debut season in the first team (08/09) was far from spectacular, scoring three goals in sixteen matches, eight of those appearances from the bench. But knowing that they had a rough diamond, Sparta Prague kept faith and more first-team opportunities followed in 09/10, with Bony scoring 10 goals in 35 games, helping his club to the Gambrinus Liga title. The 2010/11 campaign began with a brace against Liepajas Metalurgs in a UEFA Champions League qualifier, and by the time of the winter-break in December, Bony had scored 17 goals in 24 matches. Vitesse had been monitoring Bony’s progress and had a €4m offer accepted by Sparta Prague on 30 January 2011. Injury meant the Ivorian had to wait until 20 February to make his debut, but unperturbed by the ‘false-start’ to his Eredivisie career, Bony managed to score as a substitute in a 2-0 win against De Graafschap. Three goals followed in his first four games and the GelreDome had a new hero. That soon turned into cult status when Bony managed 18 goals in his first full season in the Netherlands (11/12). 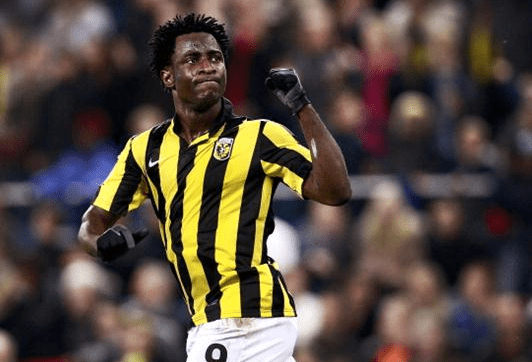 Despite inevitable interest from around Europe, Bony decided to continue his development in Arnhem and it proved to be a wise decision – ending the 12/13 campaign with 37 goals in 36 games across all club competitions. He’s also found his feet at international level, scoring in each of his last three games for the Ivory Coast, as they look for a long-term successor to Didier Drogba. It’s comparisons with the former Chelsea forward that have inevitably dominated conversation about Bony in England, and there are undoubted similarities between the pair, yet it’s lazy, simplistic and creates unnecessary pressure on Bony, to label him the ‘new Drogba’. That said, a good start in England is vital if that tag isn’t to prove a burden. Supporters of rivals clubs like nothing more than sneering at the ‘new so-and-so’, who turns out to be anything but, especially when they’ve cost big money. I honestly don’t expect that to happen with Bony though – this is a player who is very much his own man – his physical strength mirrored by an equally strong personality. A man with a firm belief in his own ability, which is partly borne out of a patient and methodical route to the top. Aged twenty-four now, the current Dutch Footballer of the Year is surely as ready as he’ll ever be for a shot at one of European football’s ‘elite’ leagues.